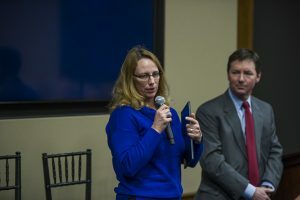 Rep. Mindi Messmer with Tom Sherman, M.D. National Cancer Prevention Day. Residents of a condominium complex in Petoskey, Michigan recently learned that their home was built on a Superfund site. They also learned that the air in their residences was poisoned with a cancer-causing chemical at 35 times the allowable limit. A similar situation happened in Grand Rapids, Michigan when 28 residents and employees were evacuated from buildings where the air in their homes and workplaces caused dangerously high levels of the cancer-causing chemicals in their blood. In both cases, references are made to trichloroethylene (TCE) or tetrachloroethene (PCE) but no reference is made to other “daughter” chemicals (i.e., vinyl chloride), some are more toxic breakdown products and are also likely to be in air in homes. According the Michigan Department of Environmental Quality, more than 40 sites with dangerously high chemical vapors in indoor air have been acted upon by the state of Michigan over the past year. Michigan estimates that there may be as many as 4,000 sites like this statewide where people are being exposed to high levels of cancer-causing chemicals in their homes. These are real people, including young children who are most vulnerable to toxic chemicals, breathing in toxins in their own homes after unknowingly living on top of toxic waste. Almost 40 years after Lois Gibbs exposed the very same thing in Love Canal, New York in 1978. The National Priorities List (NPL) is a list of “Superfund” contaminated sites throughout the United States. The two Michigan sites are listed on the NPL along with 1333 other sites. Love Canal in New York was deleted from the NPL in 2004. There is a total of 393 sites that have been deleted from the NPL. How many of these are in your backyard? In my home state of New Hampshire, we have two Superfund sites within a few miles of my home. Perfluorinated chemicals (PFCs) have been detected in drinking water at very high concentrations at both sites. One of which, former Pease Air Force Base, closed down a primary drinking water well for the City of Portsmouth and the other, Coakley Dump Superfund site threatens drinking water safety in approximately 300 homes in Rye, Greenland and North Hampton and a public water supply for Hampton, New Hampshire. People who bought homes around Coakley dump in approximately the last 10 years had no idea what beast lurked in their backyards. This is the same area that has two pediatric cancers that form a CDC-defined cancer cluster. There are also now higher than expected levels of pediatric brain cancer in the cluster area. The Business and Industry Association of New Hampshire has polluters as their members like Saint Gobain and Lydall Manufacturing. They fight legislation intended to make sure our water is safe to drink. Polluters need to be held responsible to clean up their messes so our parents and children stop getting sick. Is there a cancer-causing toxic mess in your backyard?